Back to back 5-1 victories at the SKYex saw Paul Hughes’ side move to within a point of leaders Marlow with two games in hand as Westfield were the latest to face the force of the United attack on Tuesday evening with in form Hassan Jalloh netting two more, the second already a contender for goal of the season. The first half hour of the game however was much closer than the final scoreline would suggest as the visitors were both well organised and quick on the attack which caused United a few problems with Andrew McCorkell possibly the busier of the two ‘keepers during this time. United did however have the first efforts at goal, in just the fourth minute when Hassan Jalloh and Lee Barney combined with the latter laying the ball off to skipper Scott Donnelly, his 20 yard drive only just clearing Gary Ross’s crossbar. A few minutes later United went even closer as Donnelly played a short corner to Scott Bridges who rolled the ball perfectly to Toby Little who took a touch and hit a sweet drive that cannoned back off the Westfield post with Ross beaten all ends up. In just the 12th minute United had a scare of their own to contend with as the visitors played a long ball up into the United box, defensive hesitancy allowed Aaron Watson to get to the ball first, his effort being blocked initially by Andrew McCorkell with the rebound by William Efambe being cleared off the line by Roddy Collins for a corner. The corner kick was met in the middle by Adam New who was denied by an excellent tip over by McCorkell with the following corner coming to nothing. Little and Donnelly soon after combined to give a shooting chance for Jalloh but he pulled his effort wide of the target although it was a different story three minutes later as Jalloh collected the ball in his own half, outpaced a chasing midfielder and with the Westfield defence backing off, the United man slotted the ball past Ross inot the bottom corner from 20 yards out to give United the lead. 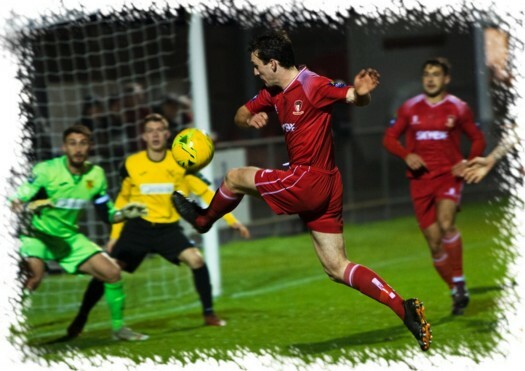 Having gone ahead, Paul Hughes made a tactical change to a flat back four by replacing wing-back Rylan Myers with central defender George Spiers and five minutes later United doubled the lead. Bridges collected the ball in the centre circle and sent Barney out toward the left of the Westfield box, a neat switch inside to Little saw the United left wing-back fire right footed past Ross for his eleventh of the campaign. 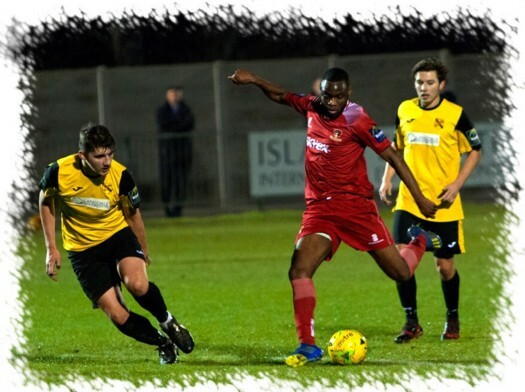 Five minutes further on and two become three when Donnelly’s corner from the left side was headed home in the middle by recent signing from Southall, Ash Nzala, his second goal in three games for United. On the stroke of half time the visitors were inches away from reducing the deficit when T’Sharne Gallimore sent Tinashe Nkoma away on the right side, his low driven centre just evading the sliding figure of Andrew Mensah in the United six yard box and it remained a three goal advantage for Paul Hughes’ side at the break. United came out quickly after the break looking to increase the lead. Ross saved from Nzala early on after the striker had flicked a Donnelly centre towards goal and then Jalloh and Barney worked an opening for Nzala to run onto but again he was denied by Ross who saved with an outstretched boot this time. The midway point of the half saw Jalloh get his second and United’s fourth with a real contender for goal of the season. 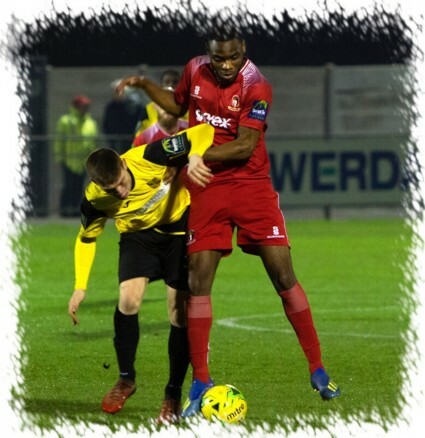 Jalloh won the ball in the United half from George Frith, nutmegged his first challenger on the half way line, advanced on the Westfield box before swerving past another challenge then nutmegging a second Westfield player before curling the ball into the bottom corner from the edge of the “D”. Fifteen minutes from time the visitors did reduce the arrears with a rare second half sortie forward of note, a quick exchange 20 yards from the United goal saw the ball collected by Westfield substitute Kiye Martin who lofted a dipping shot over McCorkell into the top corner of the United net. As the game moved into the final few minutes, Nzala twice went close, firstly he showed good strength to get away from his marker on the left before cutting in and firing across goal and wide although an unmarked Barney in the middle may have been a better option. The same player was then denied by Ross as we entered stoppage time. There was still time however for United to net a fifth when a well struck McCorkell free-kick picked out substitute Josh Chamberlain on the left side, he raced away and into the box and as Ross moved off his line toward the incoming Barney, Chamberlain showed excellent precision to slid the ball the other way straight into the Westfield net and again it was “job done” for United with Marlow now firmly in our sights.